For screen-printing substrates in Flat Sheet/Board form made of non-deforming materials. Ex: Stickers, Decals, Posters, Nameplates, Sign Boards, Printed Circuit Boards, etc. 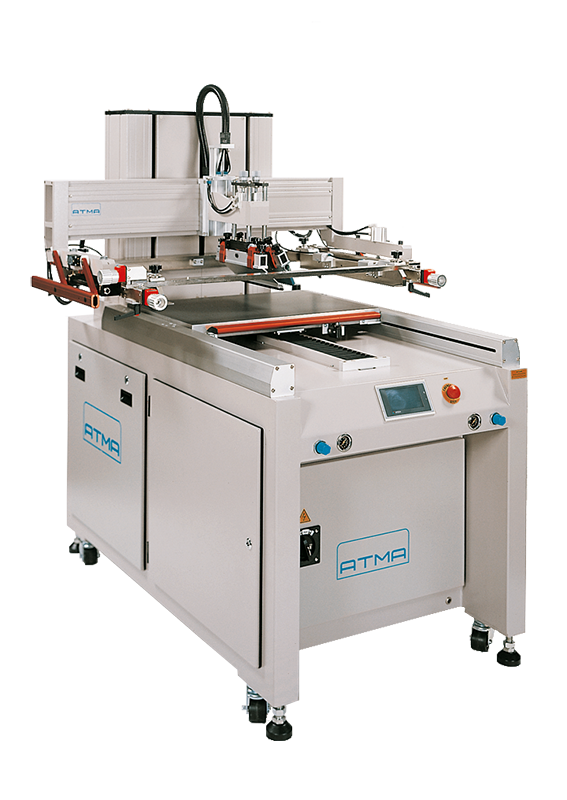 Semi-automatic: hand load / hand off-load with sliding table for easier substrate loading and unloading. Includes controlled automatic printing functions. Max. O/D frame size ((DxW) 700mm x 800mm 27½" x 31½"
Working table size (DxW) 500mm x 700mm 19⅝" x 27½"
Max. print area(DxW) 400mm x 600mm 15¾" x 23⅝"
Table adjustment (X,Y) ±10mm，±10mm ±0.39"
Dimension(WxDxH,cm) 130x160x168 51" x 63" x 66"
A.	German S.E.W. Motor powers screen up/down position and drive motor for squeegee / flood travel. Provides high cycle speed with smooth mechanical movements, low noise and accuracy. G.	Squeegee and flood printing parameter settings for speed, pressure, and stroke travel distance is independently controlled by single action from the touch screen. I. Stable pneumatic cylinders are encased around solid cast to allow consistent pressurization of squeegee and flood. After initial setup pressure regulator can be increased and decreased on the fly. For most applicable suitable pressure is 3-4 bars and the squeegee and flood both have pressure gauge to measure incremental setting amount. J. Touch screen control of peel-off action to assist release of ink and mesh from substrate synchronized with the print stroke in the auto-mode of operation. K.	Peel-off height lifting point adjustable by low speed cylinder depending on print stroke with speed adjustment valve and mechanical adjustment to set peel-off height. Flood coat sequence is carried out with the frame in the horizontal position allowing a no peel flood function. This benefit offers more uniform control and evenness of ink layer over length and width of image area. L.	Touch screen control of off-contact height between substrate and screen. Numerical value can be set up to accommodate substrate thickness 0 – 120 mm (0 – 4.7”). N.	Choice of six print functions from touch screen: flooding before the print stroke, flooding after the print stroke, higher cycle speed-flood while screen lifts to full up position, double squeegee printing mode with use of two squeegees mounted allowing printing in both directions and screen lift up to print position, twice printing mode (flood while screen lowers and the last flood when screen is in up position) and double squeegee mode with use of two squeegees to perform left print direction while right squeegee is idle and right print direction while left squeegee is idle. Includes no flood setting and print head lift for ease of sq / fl load and unload without removing for fast setup. O. Touch screen input of printing standby height: AT-60PD / PPD 150-260mm, AT-70PD 150-270mm, and AT-80PD 150-300mm. This is the distance that the screen lifts up after the squeegee and flood sequence. Numeric value can be preset to stop the screen in a lower position for increase cycle speed. P.	Squeegee / flood assembly is synchronized and changeover is pneumatically operated for smoother transition. Adjustable height controls, angle settings 0-30°, leveling and skew feature. Provides uniform ink deposits across the entire print area. Q. Touch screen input variable and independent for print and flood stroke speed and length setting to image size. Numerical input of right print stroke start point AT-60PPD 0-300mm. R.	Touch screen preset for printing position settings. Printing offset distance (5-50 mm) protects squeegee edge and mesh from wear by precisely lowering the squeegee past the leading edge of substrate. Premature wear or damage of squeegee and mesh can occur when squeegee moves across sharp edges of substrate when in direct contact. S.	Print operating cycles: Manual settings for setup procedure, setting for foot pedal control in single cycle and fully automatic control with dwell timer range of time selectable from 0.2-60 seconds for substrate loading and off-loading. T.	Productivity preset in numerical values for throughput can be changed anytime. Enter production quantity according to run length and during the run screen will indicate current yield until preset number of prints are achieved. U.	Frame loading and unloading from the front of the machine to facilitate fast setup and changeovers. Frame holding rails can be unlocked from touch screen and easily adjusted to the size of the frame. V.	Control system for compressed air supply is an oil free FRL unit to prevent oil mist pollution, applicable in clean room environment. W.	Equipped with powerful turbine vacuum control to prevent movement of the substrate. X. Emergency press plate positioned in front of print table in case substrate alignment is not in the correct position. Operator can press the plate and printing head slowly lifts up to the full upright home position allowing operator the chance to register correctly final substrate alignment. Reduces spoilage and yields more printed product. Y. Front safety bar location on the print head, compliant with OSHA safety regulations. Z. Includes 3 squeegee holders and 3 flood coaters, sq. / fl clamps, pedal switch control, toolbox, tools and door key.